ScreenSteps Desktop 2.9 and Workgroup DocumentationScreenSteps Desktop & WorkgroupCreating Word Templates Working With Word TemplatesWhere Can I Find Word Templates? 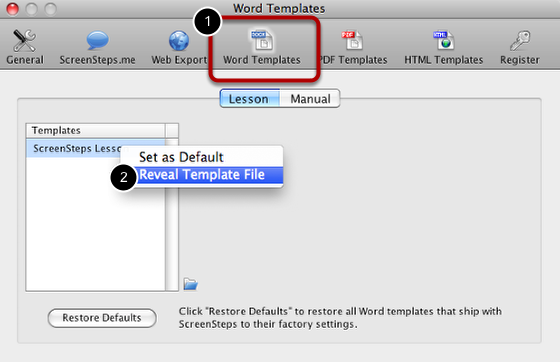 This lesson will show you how to locate the template folder for Word export. You can customize and add your own templates to this folder for use when exporting ScreenSteps content to a Word DOCX file. Open the Word Templates pane in preferences and either (1) right-click on a template and select Reveal Template File or (2) click on the Reveal Template Folder button to reveal the DOCX (DOCX is the file extension of the documents ScreenSteps creates) template folder in the Finder (Mac) or Windows Explorer (Windows). When the DOCX folder is revealed you will see a Lesson and Topic folder. You will place your templates in one of these folders. 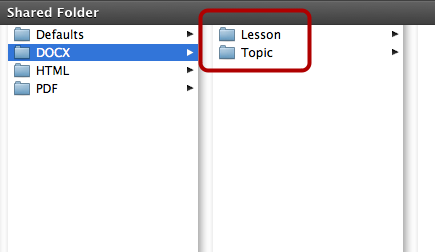 Note that the Topics folder contains templates that can be used when exporting a manual. Next: How Do I Create A Lesson Template? My word templates button is inactive and I cannot export to work even though I have documents in the DOCX folder. If the button is inactive then you probably have a ScreenSteps Standard license. Word export is only available with ScreenSteps Pro.